Following on from previous reports of dramatic increases in international applications to Canadian universities this year, we are now seeing the first indications of corresponding growth in yield for the 2017/18 academic year. There are no official country-wide results as yet, but all of the underlying indicators, including student visa applications and the volume of admissions files, are pointing to a banner year for international enrolment in Canadian higher education. Canadian universities are now starting to provide some early updates on the yield on international applications for 2017/18 – that is, the percentage of applicants that formally accept offers of admission – and these again suggest significant growth on the horizon. At the University of Alberta, for example, yield is up 27% this year, in part driven by an 82% bump in international post-graduate applications. Driving that overall growth in demand for space in advanced programmes is a 60% jump in admissions applications from US students, a 152% increase in applications from Indian students, and a nearly 200% growth in admissions files for Iranian students. On the undergraduate side, Alberta reports a 27% increase in international applications this year, compared to 11% year-over-year growth for the same period in 2016. While many institutions have seen substantial growth in admissions volumes from Mexico, India, and the Middle East, a number of Canadian universities are also reporting increased interest from American students this year. The University of Toronto, Canada’s largest post-secondary institution, has seen its yield for US students double for 2017/18. Fuelled in part by increased interest from American students, Ryerson University, also in Toronto, has seen its admissions yield for the coming academic year grow by nearly 50% compared to 2016 levels. Smaller institutions across the country, including Mount Saint Vincent University in Halifax and Brock University in Ontario, are also reporting a doubling of US admissions volumes for this year. Many have wondered if the sharp increase in interest by Americans, and other foreign students, is a function of the current political context in the US. That does appear to be playing a part, but students are also quick to point to other decision factors, including the relative cost of study in Canada, the availability of health care, and the safe and welcoming environment in the country. A weakening Canadian currency is playing a part in boosting Canada’s affordability for foreign students. 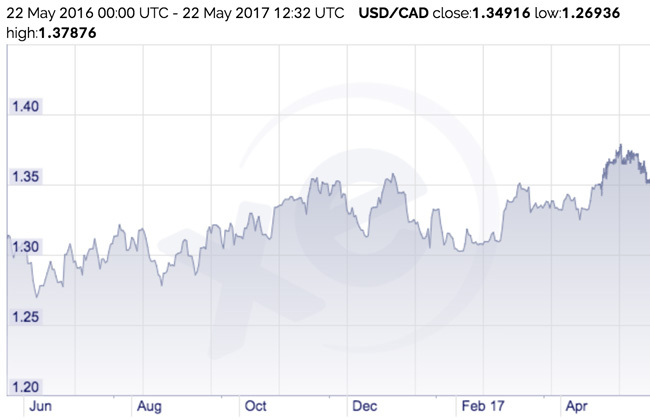 After an extended period where the two currencies trade at or close to par value in the early part of this decade, the Canadian dollar has fallen off against the US dollar by about 6% over the past year alone. The Times also spoke to Megan Ludwig, a Californian who has opted to pursue her master’s degree in Canada. “Canadian tuition is half the price per semester or less than most US universities and scholarships for master’s positions are less competitive and more widely available,” Ms. Ludwig explained to the paper. In part because international recruitment channels are less developed in the US, including, for example, few agencies that actively refer US students to Canadian schools, many institutions have historically taken a more passive approach to recruitment in the US even as they invested heavily in markets overseas. However, the current cocktail of US politics, relative costs of study, and more open immigration policies in Canada is now in turn driving increased interest on the part of Canadian recruiters. Indeed, a number of Canadian universities have begun to sharpen their recruitment efforts in the US this year. In one reflection of this trend, the journal University Affairs recently highlighted the cases of University of Regina as well as Laurentian University, two smaller Canadian universities that are in the midst of stepping up their US recruitment strategies. This entry was posted in Canada, Higher Education, North America, Regions and tagged foreign enrolment in Canada, universities with international students, college admissions, postgraduate student recruitment, international students.